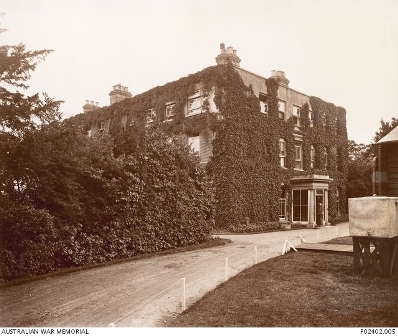 Exterior of `Harefield House' the former stately home taken over by the No. 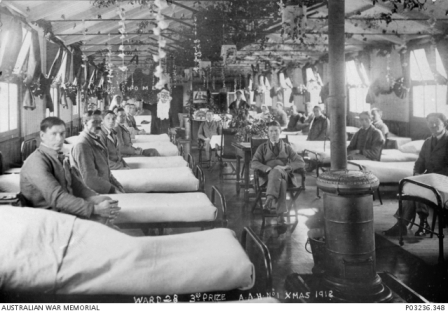 1 Australian Auxiliary Hospital (1AAH) in 1915-03. On the right is the corner of one of the first wards and hidden from view behind the shrubbery is the bay window of the first operating theatre (formerly the sitting room). Harefield, England. c. 1918. 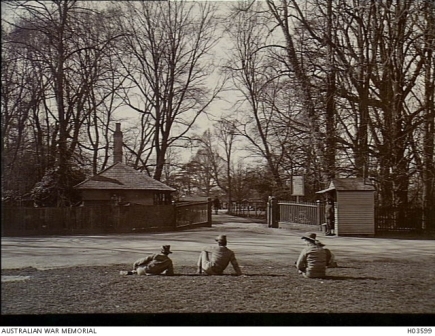 Three Australian Army patients seated on the grass opposite the entrance to No 1 Australian Auxiliary Hospital. Harefield, Middlesex, England, 1914-18. Staff at No. 1 Australian Auxiliary Hospital. Harefield, England. Group photograph of Australian Staff Nurses in the grounds of No 1 Australian Auxiliary Hospital. Group portrait of patients at the No 1 Australian Auxiliary Hospital (A.A.H.) at "Harefield Park", Middlesex, England, at Christmas 1918. The ward has been festooned with Christmas decorations and a Santa Claus and on the rear wall is a large map of Australia with the word "HOME" printed in large letters. Also displayed on a column in the middle of the ward are copies of the Australian Coat of Arms and the A.I.F. Rising Sun Badge. Harefield, England. A wounded Australian soldier, who lost both hands, writing a letter by using the stumps of his wrists to hold the pen at No 1 Australian Auxiliary Hospital. Harefield, Middlesex, England. c. 1918. The Australian corner of Harefield churchyard, containing the graves of 111 AIF personnel and one nursing sister who died of wounds or illness at No. 1 Australian Auxiliary Hospital, Harefield Park. The graves have rectangular headstones with carved scrolls at top and bottom and all bear the words "Erected by his comrades" and "ANZAC". Reading from front to back the headstones include: Far left: 170 Private (Pte.) Robert Sydney Wake, 5th Battalion, died 1916-02-08 aged 24; 323 Private (Pte.) Cecil Rupert Rowlands, Australian Army Medical Corps (AAMC) died 1916-07-20; second row: 185 Private (Pte.) George Arthur Kelly, 2nd Battalion, died 1916-04-17 aged 31; 1562 Private (Pte.) Leslie Knox, 1st Battalion, died 1916-11-15 aged 21; third row: 196 Sergeant (Sgt) Thomas Regan, 8th Light Horse Regiment, died 1916-07-02 aged 27; 1748 Private (Pte.) Percy Albert Giddens, 14th Battalion, died 1917-01-01; fourth row: 4585 Private (Pte.) Arthur John Taylor, 10th Battalion, died 1916-07-16 aged 37; 13810 Private (Pte.) Mervyn Francis Moffatt, 1st Australian Auxiliary Hospital, died 1916-10-10 aged 19.